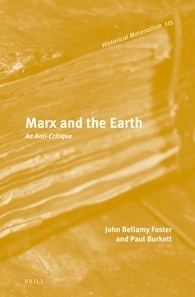 Marx and the Earth is a detailed and vigorous defence and reassertion of the classical Marxist position in regards to Marx's Ecology. My review of this book was published in the International Socialism Journal 153, January 2017. You can read it there. In the meantime feel free to have a look at some reviews I've written of other books by these authors. 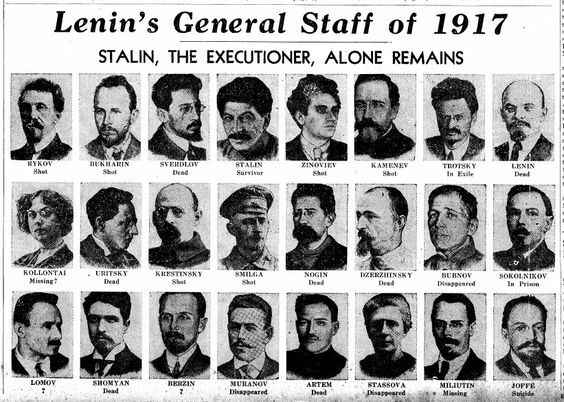 There's an old propaganda image (see below) that shows the Bolshevik leaders from 1917, the year of the Russian Revolution, listing the fate of each of them under Stalin. Many are dead, and of those living when the image was made, the remainder would perish under the dictator. Some of them would admit to fantastical crimes against the Revolution in show trials. Others simply disappeared. The familiar names and faces from this image are matched by thousands of anonymous others who died in labour camps, or in front of firing squads. To protect his new order, Stalin had to both ideologically break with the old Bolshevik revolutionary ideology and destroy those who had fought for it. Alexander Shlyapnikov was one of those Old Bolsheviks. He became a committed revolutionary as a young metalworker, working closely with Lenin, and eventually became a member of the Bolshevik organisations' central leadership. Under the Tsar Shlyapnikov became a highly respected workers leader, organising both the socialist movement and the early trade union movement. 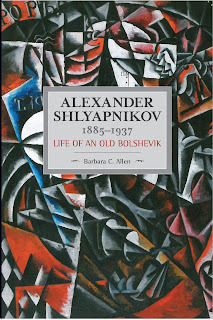 Barbara C. Allen's book is a detailed study of this revolutionary life, based in part of Shlyapnikov's autobiogrpahies and her own painstaking work in Russian archives. Shlyapnikov had become a highly skilled metal turner and fitter, a crafty and conspiratorial underground activist and a steadfast Bolshevik. As such he belonged to an exclusive group of 'conscious' Russian proleatrians. In Western Europe, however he took a path that dfiverged from that of many other radicalised Russian workers. Life and work there gave him the opportunity to observe foreign trade unions' methods of organisation. Acquisition of fluent French and proficiency in German and English facilitated his education in Western-European labour organising and radical socialism. Shlyapnikov became a key figure for the Bolsheviks' helping organise the distribution of revolutionary materials into Tsarist Russia across the Finnish border. During the revolutionary year of 1917 he became a central figure in the metalworkers union, which formed the basis for his support in the major debates that took place after the revolution. The decimation of the Russian economy and population following World War One and the counter-revolutionary Civil War undermined many of the ambitions of the Revolution. Quickly it became clear that there needed to be drastic changes to defend the Revolution and save the situation. Hundreds of Bolsheviks and workers engaged in these debates throughout Russia, and Shlyapnikov placed himself at the heart of these, particularly given his position as a former industrial worker and trade unionist. According to his proposals, reflected in major speeches, papers and published articles (1919-20), trade unions would replace state economic bodies as managers of the economy. Moreover, the CC [of the Bolsheviks] would stop interfering in the everyday affairs of local part, trade union and factory-committee organisations. He believed that the active, voluntary participation of the workers was essential for economic development and in building the new socialist society. It would be difficult to disagree with Shlyapnikov's visions here, yet as the situation worsened through the 1920s, this idea of socialism became more and more distant. Enormous debates took place about the role of workers, trade unions and the peasantry. Shlyapnikov argued his position firmly, though it seems to me that he was guilty of a certain utopianism, or idealism when, for instance, he argued that the problem with the New Economic Programme was its focus on the peasantry. In an economy dominated by the peasantry, after the failure of European Revolution, there was always going to have to be a compromise with the peasantry for the survival of the revolution. Having taken an increasingly oppositional position during the debates of the early 1920s (Shlyapnikov was a key figure in the Workers' Opposition) he became a target for the increasingly repressive regime as Stalin cemented his position. In the early 1930s he was expelled from the Communist Party, despite apparently still being very much of the position that he could play a key role in developing the Russian economy and defending the revolution. In these years he certainly seemed to have been increasingly Utopian about the nature of the Soviet economy, and though he made little attempt to organise factionaly, the fact that he had been publicly outspoken in the past, meant that he was a target for Stalin's increasingly paranoid spies. Tried, imprisoned, exiled and eventually executed, Shlyapnikov never broke from his ideals, declaring his loyalty to the idea of Soviet power at the very end of his trial. He put up with debilitating illness and saw former comrades break under the pressure, yet he never backtracked on his principles. Sadly, in the appalling, counter-revolutionary atmosphere of 1930s Russia, Shlyapnikov's "guilt" was extended to his family who all suffered into the 1950s as a result of their association with him. Shlyapnikov is a fascinating character, and deserves a detailed biography. Sadly though, I was disappointed by this book. Despite the author's detailed knowledge of the source material, I felt that her understanding of Shlyapnikov was undermined by her lack of clarity on his politics, and those of the wider revolutionary movement. At times, her explanation of Bolshevik ideas, particularly those of Lenin, is limited. For instance, when discussing Bolshevik debates about the national question, she writes that Lenin "saw nationalism as a powerful force for bringing about revolution", a statement that is at best an extremely simplistic summary of Lenin's nuanced political position around the question. Similarly I felt that the author lacked an understanding of the way that the economic situation was negatively transformed by the Civil War. For instance, the discussion of the Kronstadt Rising implies that those who had been so pro-revolution and supportive of the Bolsheviks during 1917 were the same as those who rose up in 1921. Yet the reality, as both Lenin and Trotsky repeatedly made clear, was that the core of the Kronstadt workers and sailors had been decimated and was dominated by the 1920s with former peasants who were no longer as seeped in revolutionary politics and experience as their predecessors. I think the fault is that the author while acknowledging that Shlyaphikov still "continued to believe in revolution" right until his death, thinks that this was naive. Sadly, this lack of clarity about the backdrop to Shlyaphikov's life and struggles undermines what should be an excellent book. Nonetheless, for students of the Russian Revolution, the sections on Bolshevik activity in the workplaces before the Revolution and the internal debates after the revolution will be of interest. 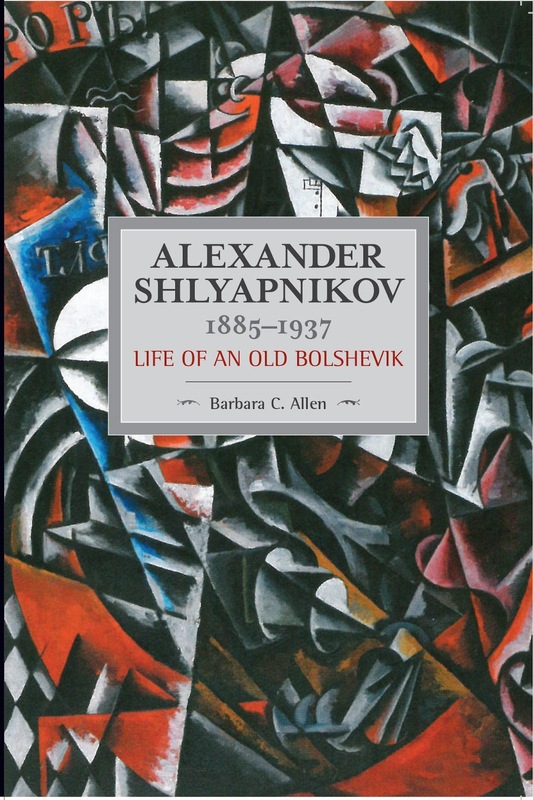 And despite some flaws, Barbara Allen's finally frees Shlyaphikov's life and politics from Stalinist distortion and lies. 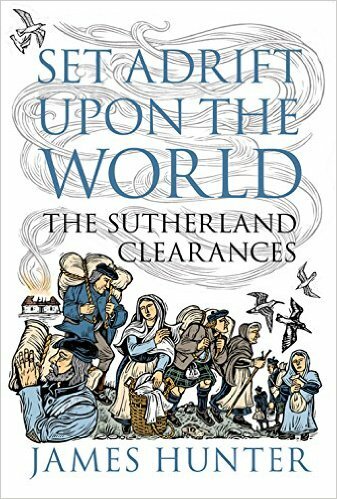 This study of the part of the Highland Clearances that took place on the Sutherland Estate in the first quarter of the 19th century makes for an important new book. 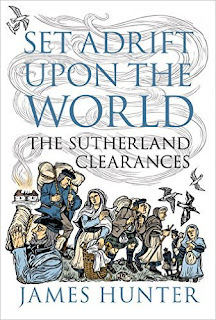 James Hunter locates the Clearances, infamous for the role of Patrick Sellar and the Marquis and Marchioness of Stafford (later the Duke and Duchess of Sutherland), not as part of an inevitable economic development, but as a brutal part of the class struggle in the Scottish Highlands between landowner and tenant. As a consequence the author shows how the modern Scottish landscape, enjoyed by thousands of tourists every year, has been fundamentally shaped by this struggle. A landscape that resulted from centuries of farming, was in turn transformed by sheep farming and a later switch to grouse and deer. Thus the "natural" landscapes are not natural in the slightest, they are the result of centuries of human labour and the victory of a tiny number of landowners over thousands of farming families. The homes, schools and churches that were used by thousands of people now lie buried and forgotten with the soil itself tainted by the blood spilt during the evictions. rather like settlers on some North American frontier... at the cutting edge of an increasingly commercialised civilisation's advance into a region where older forms of social organisation remained the norm.... The clash, to be sure, was a lot less violent than analogous conflicts between homesteaders and Native Americans. But the issue at stake in this Sutherland collision was the same as that posed by North America's frontier fighting: which of two incompatible ways of life was to prevail? It would be wrong to take this analogy too far. The tenants of the Sutherland Estate were not hunter-gatherers, or even pre-industrial societies. Nonetheless their methods of farming and their social organisation were a barrier to the maximisation of profits from the land. This is not to say they were backward, primitive, lazy or perpetually poor (all accusations thrown at them by the improvers and their propagandists). In fact, one of the strengths of this book is that it demonstrates the exact opposite. Those at the forefront of the evictions, like Patrick Sellar, used this propaganda to justify to the world what they were doing. Describing those being cleared from land their families had farmed for generations as "barbarous hordes" and "aborigines" was to justify the same sort of terror that had been deployed against Native Americans, First Nations peoples and other victims of colonialism. And terror it was. The deaths, the destruction of "homes, barns, kilns and mills" in defiance of the law, the burning of homes with people still inside, the abuse of due process and the deliberate destruction of materials so that those evicted lost even the chance of rebuilding elsewhere was nothing less than terror. Today, the scale of the Clearances still has the power to shock. In 1819 to 1820, for instance, some 5,500 people were forced from their homes in Sutherland. In one part of the estate, between 150 and 200 distinct communities were replaced by a mere eight landholdings. 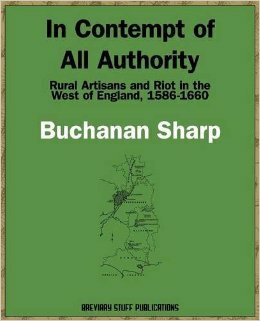 Many of those evicted ended up in far inferior coastal locations were they were expected to take up industries (like fishing) of which they had no knowledge and in unsuitable locations, lacking harbours to supplement meagre incomes from the smaller and less arable new plots of land. It is no surprise then that people fought back. The book opens with the story of a mass protest that turned away surveyors. Real or threatened protests, demonstrations and the possibility of violence clearly terrified the landowners and their representatives (though not the potential for violence against former tenants). The scandal caused by the first set of Sutherland Clearances provoked enormous criticism of the Staffords, aided by journalists and campaigners across Britain. There's no doubt that in an era of popular anger at government and the ruling class (James Hunter notes that military force was not used on a number of occasions because the army and government were frightened of another Peterloo) there was massive sympathy for the inhabitants of Sutherland. Because the resistance was unsuccessful, former inhabitants were spread "adrift upon the world". Hunter traces those who ended up in North America and Canada, and their struggle to survive the passage across the Atlantic and the harsh winters. Many of these families eventually thrived, and there's a poignant report from years later, of some of those who remained in Scotland wishing that their families had made the trip. All is solitude within the valley.. except where, at wide intervals, the shieling of a shepherd may be seen; but at its opening, where the hills range to the coast, the cottages for miles together lies clustered as in a hamlet. From the north of Helmsdale to the south of Port Gower, the lower slopes of the hills are covered by a labyrinth of stone fences, minute patches of corn and endless cottages. It would seem as if, for twenty miles, the long withdrawing valley had been swept of its inhabitants and the accumulated sweepings left at its mouth, just as we see the sweepings of a room sometimes left at the door. And such generally is the present state of Sutherland. The land had been, "improved into a desert". Karl Marx, an observer from afar of the Clearances, noted that "the history of the wealth of the Sutherland family [was] the history of the ruin... of the Scotch-Gaelic population". James Hunter ends by pointing out that the present emptiness of the Highlands is something of a strange aberration and that one day the places that had been cleared will be full of people again. While this may or may not be true one day, it is an important reminder that the countryside we take for granted is not necessarily a pristine one, but rather is in the process of constant change. The Clearances, like the Enclosures in England that cleared landscapes, destroyed communities, and transformed people into wage labourers, were part and parcel of the emergence of a system that puts people before profit. The importance of James Hunter's book is that it shows this was not inevitable, nor necessary. In doing so he rescues the stories, and frequently the names, of those who would otherwise be simply remembered as victims of the greed of the Duke and Duchess of Sutherland. 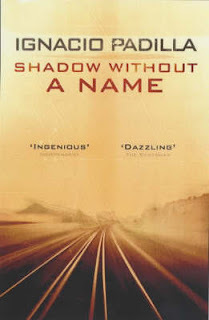 This compelling, if confusing novel spans the darkest years of the twentieth century, from the beginning of the First World War, to the aftermath of the second. Its characters live in central Europe and find themselves in the middle of war, fascism and the Holocaust. The novel begins with an attempt through a bet on a chess game, to win an identity change which will leave one person in relative safety behind the lines, and the other facing the bullets and shells in the trenches. This sets the scene for repeated changes of identity, until it becomes unclear precisely who is telling the story, about whom. These characters become embroiled in the nascent fascist movements at the end of the First World War, and eventually rise to be at the heart of Hitler's Nazi Party and, in one case, uniquely positioned to witness the beginnings of the Final Solution. To say more would spoil a complex plot that had this reader constantly looking back to earlier chapters to try and better understand events. Well written, compelling, shocking and innovative, this is an excellent novel from an author who tragically died far too young.